In 2012 Outset in association with Le Meridien Hotels and Resorts supported the production of an artist book by Anne Hardy. The book, published to celebrate the Anne Hardy exhibition at the Secession, Vienna in September/November 2012 is more than a mere catalogue accompanying her first solo show in Austria and stands independently as a creative work in its own right. The 144-page publication brings together the artist’s photographs as well as extracts from several works of literature – texts that have accompanied the artist for a significant part of her life and have influenced her thinking. With numerous illustrations, including sketches, samples of work and visual sources of inspiration, this varied collection allows readers to delve into Anne Hardy’s world of ideas and serves as a kind of guidebook to her visual language. Besides the 18 colour plates of photographs that were exhibited at the Secession, the book includes images from Hardy’s personal visual archive: Photographs of The London Aquatic Centre in Woolwich, a post-war brick Modernist building; underground entrances of buildings; self-made gym weights consisting of concrete slabs, plastic twine grips padded with cotton puffs; and the fish-tank window of Frank Lloyd Wright’s Taliesin West in Scottsdale, Arizona. 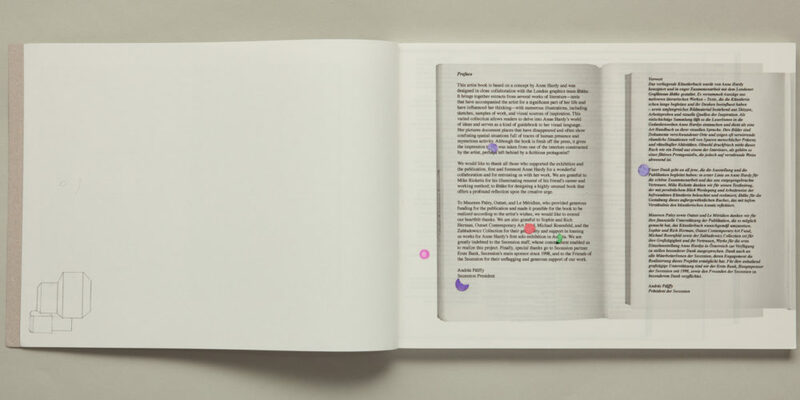 The book concept by Anne Hardy was implemented and designed in close collaboration with the London graphics team Åbäke. Anne Hardy was born in St Albans, Hertfordshire, UK in 1970. She graduated with a MA Photography from the Royal College of Art, London in 2000. In 2011, she was artist in residence at Camden Arts Centre, London. She has shown her work nationally and internationally. Anne Hardy constructs life-size sets using and assembling a variety of materials often found in the street or in second-hand shops and handmade marks. Hardy describes this process as “very sculptural, and material. Each place comes into being through a kind of tussle with the materials, and the camera creates an arena for this to happen in. I bring a place into being, imaginatively and physically by using the suggestive qualities of the various materials and objects that I work with.” In each case, the result of this process is a single photograph, as the installations are then dismantled again. Her pictures document places that have disappeared and often show confusing spatial situations full of traces of human presence and mysterious activity. Solo exhibitions include Anne Hardy, Secession, Vienna (2012); New Acquisitions from the Arts Council Collection 2010: Anne Hardy – Recent Work, Project Space, Longside Gallery; Yorkshire Sculpture Park, Wakefield, UK (2010); Maureen Paley, London (2009) and ArtSway, Sway, UK (2005). She has exhibited works in group shows including An Orchestrated Vision: The Theater of Contemporary Photography, Saint Louis Art Museum, Missouri, USA (2012); Voyage around My Room, Norma Mangione Gallery, Turin; Signs of a Struggle: Photography in the Wake of Postmodernism, Victoria and Albert Museum (Gallery 38A), London; Saatchi Gallery in Adelaide: British Art Now, Art Gallery of South Australia, Adelaide; Party, The New Art Gallery, Walsall, UK; Newspeak: British Art Now, Saatchi Gallery, London; Martian Museum of Terrestrial Art; Barbican Art Gallery, London; and at the New Forest Pavilion at the Venice Biennal 2007. Anne Hardy is represented by Maureen Paley, London.